Learn to use the basic stitches on your serger; 4 thread overlock, 3 thread overlock & rolled hem. Then expand on the basic stitches by doing several techniques such as t-shirt ribbing, corners and seams finishes. Students will make a sample notebook. 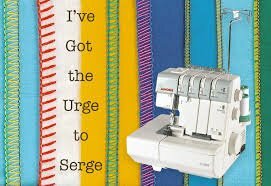 This is a great class for beginners or a good refresher if you haven't used your serger in a while. Remember to get the supply list.